101 Things Every Cook Should Cook | British food is bad? Not here. You won\’t see chicken tikka masala upside down cake or boiled pizza; you will instead enjoy 101 classic recipes and ingredients ranging from simple to advanced and from traditional to exotic. 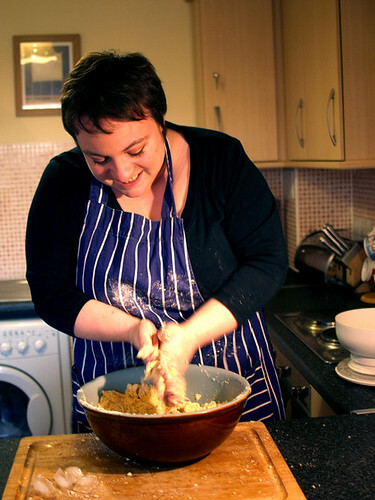 Entertaining recipes from an enthusiastic cook in Britain that every good cook should know, all interspersed with the blather of a food obsessive. Hello. This is me. I thought you might like to see what I look like after almost 4 years writing this blog. So here I am making some pastry. I like making pastry. 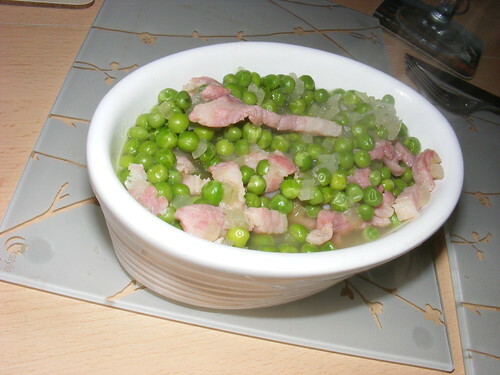 A simple side dish that takes 5 minutes to make, to be served with pretty much anything you like, because bacon goes really well with peas. Ok, in a non-stick pan fry the bacon to whatever consistency you like it. Just cooked or nice and crispy, up to you. 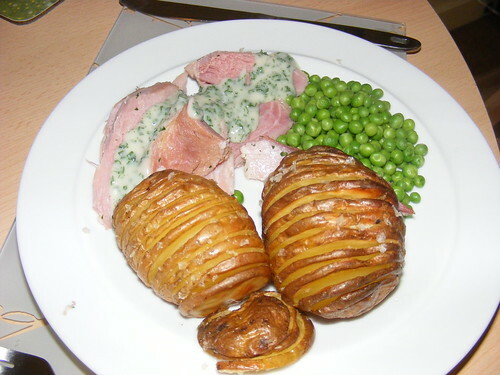 Once it’s as you like it, add the chopped onion and fry until soft but not coloured (about 2 minutes), then throw in the peas, give it a stir and pour in just enough chicken stock to moisten the whole thing. 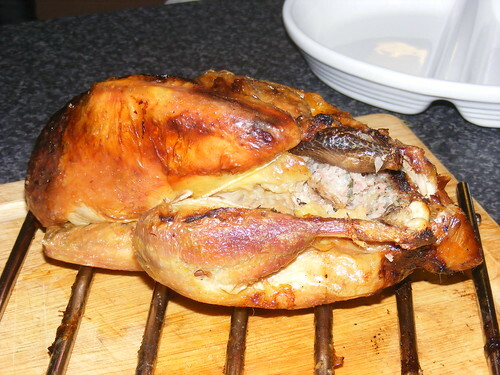 Cook for a couple of minutes and you’re done! This is excellent with a nice Sunday roast. 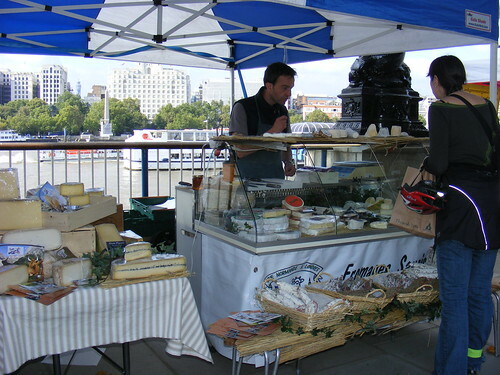 The Slow Food movement is running a food festival on London’s South Bank from today until Sunday 21st. 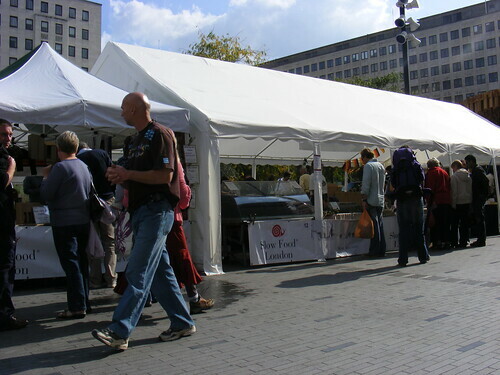 They’re running free food demos, sampling, a “busy bee” craft tent for kids and a good range of food and drink stalls. The Slow Food movement is incredibly important for anyone who believes in quality, honest, fair global produce. I’m a member and so should you be, there’s bound to be a branch near you. I went along to the festival today and found it small but perfectly formed. Arranged around the Royal Festival Hall, there’s oysters, bread, cheese, meats, game, a very tasty Portuguese pork roast, and much more. 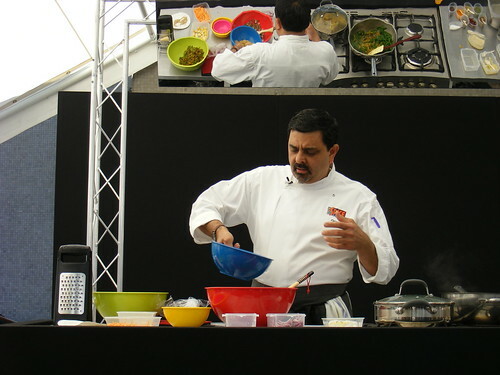 The cookery demonstration given by Cyrus Todiwalla of Cafe Spice Namaste was very good – it’s not often nowadays you can get an entertaining and informative lesson for free. The talk by Peter Gott of Sillfield Farm was a good lesson in what slow food really means and the importance of supporting pig farmers in this country. 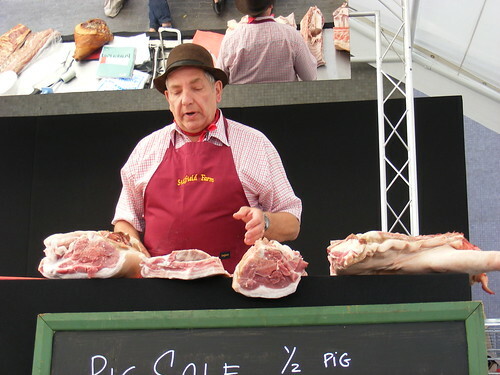 And he showed us how to butcher half a pig, which is always a useful lesson. I bought a large bit of the belly for a tenner, which is a bargain when you know how much attention and care goes into producing it. The festival runs for another three days and includes talks/demos inlude how to smoke your own food at home, how to make honecomb, great dishes for under a fiver and “Be a bee” for kids. Go along!